A 14-day tour of Vietnam's South and Central Highlands, and Cambodia. 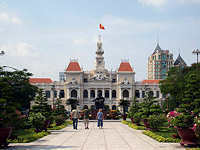 Welcome to Ho Chi Minh City! Upon arrival, you will be met and assisted by our friendly representative all the way from the airport to your hotel. The rest of the day is at leisure for you to rest after your journey. Evening dinner at a local Vietnamese restaurant. Morning at leisure. Transfer to airport for your afternoon flight to Central Highland of Buon Ma Thuot - the city of aromatic coffee. Transfer to Lak lake for check-in. Dinner and overnight at Lak Resort. This morning we visit the M’nong hill tribe village of Jun and take a dugout ride on Lak Lake and an elephant ride through village or a visit to M’lieng village. Transfer to BMT to visit Buon Ma Thuot museum of ethnology and Ede tribal village in Ako Dhong, a visit to D'raysap Waterfall. Overnight at a local hotel. Transfer to Kodong for trekking through four villages of Bahnar ethnic minority and overnight at Decop village. In the evening, enjoy the traditional show of Bahnar songs and dances, drink 'Can' (rice) wine. Overnight at village longhouse. Today we visit the wooden cathedral and the orphanage school nearby, the Pleiku market, T’nung lake (volcanic lake) and then transfer to Pleiku airport for the flight to HCM City. On arrival, transfer to hotel. Leave Ho Chi Minh City by road for Phan Thiet. The scenic 200km drive north on Highway One passes through the bustling city of Bien Hoa before cutting through dense rubber plantations. Nearer to Phan Thiet the terrain changes to arid semi-desert with cactus plants and strange looking dragon fruit trees. Arrive in Phan Thiet in the late morning and check into resort. The rest of day is free to relax by the pool or on the sandy beach. Overnight at hotel. Transfer to airport for your flight to Siem Reap, Cambodia. Our Cambodia guide will meet you and transfer you to your to hotel. After lunch at a local restaurant, take a boat trip & enjoy the wonderful views of Tonlesap Great Lake, and visit the beautiful Phnom Krom temple by the lake. Evening dinner is taken at a local restaurant with traditional Cambodian dance performances on stage. Overnight in Siem Reap. 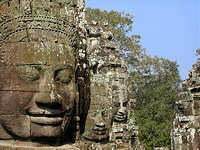 The antiquites of Angkor are on the agenda today, starting with the ancient royal capital of Angkor Thom: Bayon, Thommanon, Chau Say Tevoda, the Terrace of Elephants and Leper King and Taprohm temples. After lunch we visit 7th World heritage wonder, Angkor Wat, followed by the Ta Som, Ta Keo and Pre Rup temples. Return to town. Transfer to the airport for your flight to Phnom Penh, where our Phnom Penh guide will meet you and transfer you to your hotel. Afterwards, we take a city tour of Phnom Penh, including the Royal Place, the Silver Pagoda, the Raung Damrei Museum, the National Museum of Fine Arts, the Independence monument and central market. A visit to Toul Sleng Museum of Genocide plus a trip to see the world famous Killing Fields. (These trips are included, but optional). Then at leisure until it is time to transfer to the airport for your return or onward flights. The Central Highlands of Vietnam are less visited, but offer stunning landscapes and interesting people.